1. Run an 8 car G train from Court Square and switch it at Hoyt-Schermerhorn onto the A train tracks, routing it into Manhattan. The G train would then substitute for C train service in Manhattan. C trains would not run in Manhattan for the duration of the shutdown. For C train service in Brooklyn, see #3. 2. Riders wishing to continue on into Brooklyn south of Hoyt would simply remain on the G and transfer to the F train at Jay Street-MetroTech, which is the next stop after Hoyt, and riders coming up along the F from Coney Island would do the same to catch the Court Square bound G at Jay St-MettroTech. 3. 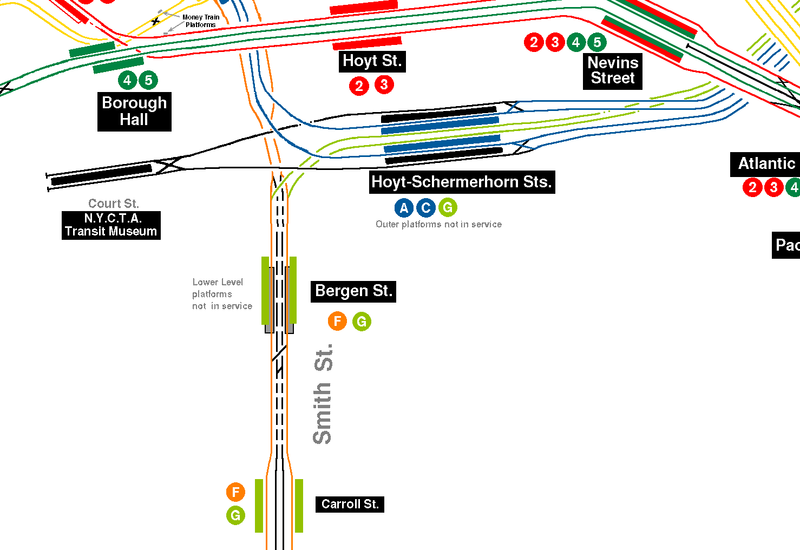 C train service in Brooklyn would terminate at Hoyt-Schermerhorn on the outside museum tracks. The outside platforms would be opened to the public. Riders heading to local stops in Brooklyn would transfer to C trains originating from those platforms. Now, everybody who needs the L train simply transfers at Metropolitan onto the G train which will take you straight into Manhattan. Once you're in Manhattan, you can transfer from the G to other lines to get to where you're going. I just solved this whole problem in five minutes. Thoughts? Posted by sloth on Tue Feb 13 01:01:06 2018, in response to THE L TRAIN SHUTDOWN SOLUTION THAT WORKS, posted by ren on Tue Feb 13 00:28:59 2018. It would help if there were any crossover switches between the G and the A at Hoyt. There aren't. Posted by ren on Tue Feb 13 01:24:57 2018, in response to Re: THE L TRAIN SHUTDOWN SOLUTION THAT WORKS, posted by sloth on Tue Feb 13 01:01:06 2018. Oh, you're right! Well, so much for my plan. I don't think there's much chance of them installing switches there. Re: THE L TRAIN SHUTDOWN Soulition based around something that doesn’t exist. Posted by The Silence on Tue Feb 13 01:25:01 2018, in response to THE L TRAIN SHUTDOWN SOLUTION THAT WORKS, posted by ren on Tue Feb 13 00:28:59 2018. Posted by ren on Tue Feb 13 02:16:04 2018, in response to Re: THE L TRAIN SHUTDOWN Soulition based around something that doesn’t exist., posted by The Silence on Tue Feb 13 01:25:01 2018. Posted by SLRT on Tue Feb 13 06:43:59 2018, in response to Re: THE L TRAIN SHUTDOWN Soulition based around something that doesn’t exist., posted by ren on Tue Feb 13 02:16:04 2018. Posted by Dave on Tue Feb 13 07:18:56 2018, in response to Re: THE L TRAIN SHUTDOWN Soulition based around something that doesn’t exist., posted by SLRT on Tue Feb 13 06:43:59 2018. Posted by Lou from Brooklyn on Tue Feb 13 08:15:05 2018, in response to Re: THE L TRAIN SHUTDOWN SOLUTION THAT WORKS, posted by ren on Tue Feb 13 01:24:57 2018. Posted by AlM on Tue Feb 13 09:05:53 2018, in response to THE L TRAIN SHUTDOWN SOLUTION THAT WORKS, posted by ren on Tue Feb 13 00:28:59 2018. Along with the other issues mentioned, how do you fit all the C train riders onto the A and G trains that are going into Manhattan? Posted by Olog-hai on Tue Feb 13 09:54:22 2018, in response to Re: THE L TRAIN SHUTDOWN Soulition based around something that doesn’t exist., posted by SLRT on Tue Feb 13 06:43:59 2018. Probably to play Stinky Wizzleteats' "Happy Happy Joy Joy" record again. "This is a song about a whale—no! this is a song about being happy!" Posted by TransitChuckG on Tue Feb 13 10:16:21 2018, in response to Re: The L Train Shutdown Solution based around something that doesn’t exist, posted by Olog-hai on Tue Feb 13 09:54:22 2018. Posted by Avid Reader on Tue Feb 13 10:24:31 2018, in response to Re: THE L TRAIN SHUTDOWN SOLUTION THAT WORKS, posted by sloth on Tue Feb 13 01:01:06 2018. Maybe, just maybe the"G" train could go to the Lower level of the Bergen St. Station where a second T/O could take over in the last car to reverse direction going on to the Manhattan bound "F" tracks. Thus preserving a single seat trip along 6TH Av. and continue finally terminate at "Queens Plaza", then a third T/O could Reverse direction back to the local tracks and back to the Crosstown "G" , completing a full circle. Posted by Avid Reader on Tue Feb 13 10:26:20 2018, in response to Re: THE L TRAIN SHUTDOWN SOLUTION THAT WORKS, posted by Avid Reader on Tue Feb 13 10:24:31 2018. Lower Level at Bergen St.
Posted by Stephen Bauman on Tue Feb 13 10:41:57 2018, in response to Re: THE L TRAIN SHUTDOWN SOLUTION THAT WORKS, posted by Avid Reader on Tue Feb 13 10:24:31 2018. There is no direct access to Bergen St lower level from Hoyt-Schermerhorn. Posted by Broadway Lion on Tue Feb 13 11:28:17 2018, in response to Re: THE L TRAIN SHUTDOWN SOLUTION THAT WORKS, posted by Avid Reader on Tue Feb 13 10:24:31 2018. You can see that the (GG) train has no access to the Fulton/8th Avenue lions, nor does it have access to LL Bergen. It is easier for the peeps to cross the platform than for the (GG) train to fit through the eye of a needle. Only help at this end of the (GG) is for increased (A) or (CC) service. Posted by MainR3664 on Tue Feb 13 15:13:32 2018, in response to Re: THE L TRAIN SHUTDOWN SOLUTION THAT WORKS, posted by ren on Tue Feb 13 01:24:57 2018. How difficult would it be to install switches there? Posted by ren on Tue Feb 13 15:26:30 2018, in response to Re: THE L TRAIN SHUTDOWN SOLUTION THAT WORKS, posted by MainR3664 on Tue Feb 13 15:13:32 2018. That's what I'd like to know. If they did that, you would solve this L train shutdown like a piece of cake with the solution I outlined in the original post. They already have switches between the museum tracks and the A tracks, but not between the A and the G, which I can't believe. Posted by AlM on Tue Feb 13 15:32:01 2018, in response to Re: THE L TRAIN SHUTDOWN SOLUTION THAT WORKS, posted by ren on Tue Feb 13 15:26:30 2018. 1. It's a long way out of the way to midtown. 2. You're terminating C trains in Brooklyn. Now you have 7 trains per hour of people who are going to transfer to what trains in order to get into Manhattan? Posted by ren on Tue Feb 13 15:33:04 2018, in response to Re: THE L TRAIN SHUTDOWN SOLUTION THAT WORKS, posted by ren on Tue Feb 13 15:26:30 2018. On the other hand, come to think of it, all people have to do is cross the platform at Hoyt from the G to the A, and you don't need the switches. The thing though is, the A is already packed at rush hour. They're gonna need to increase the amount of trains on the A/C. Posted by Edwards! on Tue Feb 13 15:41:39 2018, in response to THE L TRAIN SHUTDOWN SOLUTION THAT WORKS, posted by ren on Tue Feb 13 00:28:59 2018. Have you seriously thought this through? Look at any given track map, then you will understand why your plan can't work. Posted by MainR3664 on Tue Feb 13 15:44:31 2018, in response to Re: THE L TRAIN SHUTDOWN SOLUTION THAT WORKS, posted by AlM on Tue Feb 13 15:32:01 2018. I don't doubt this would be a pain in the lower anatomy. But so is the plan to put L train riders onto the M and onto buses. If switches could be installed at Hoyt, maybe that would help in a material way- though I agree not entirely solve the problem. The only "solution" is for the L work to be completed as soon as possible. Posted by Edwards! on Tue Feb 13 15:50:59 2018, in response to Re: THE L TRAIN SHUTDOWN SOLUTION THAT WORKS, posted by ren on Tue Feb 13 15:33:04 2018. We've all been here for years, brah... And basically every solution that can be thought of has been suggested already. Any infrastructure change won't be done simply due to Money. Posted by Elkeeper on Tue Feb 13 16:01:44 2018, in response to Re: THE L TRAIN SHUTDOWN SOLUTION THAT WORKS, posted by Lou from Brooklyn on Tue Feb 13 08:15:05 2018. But those X-overs are right before the Court St station, so one track of the station would have to be cleared of museum trains. Do you think that would be allowed? Posted by Elkeeper on Tue Feb 13 16:10:41 2018, in response to Re: THE L TRAIN SHUTDOWN SOLUTION THAT WORKS, posted by Avid Reader on Tue Feb 13 10:24:31 2018. Why bother doing that? Since the "F" and "G" both run local to Church Ave, add a few extra "G" trains and have them short-turn at Smith-9th st.
Posted by Broadway Lion on Tue Feb 13 16:18:21 2018, in response to Re: THE L TRAIN SHUTDOWN SOLUTION THAT WORKS, posted by MainR3664 on Tue Feb 13 15:13:32 2018. It would take more time to install those switches than to rebuild the (LL) tunnel. This is because of the grade differences. At either end of the H-S platform the (GG) has to duck under the (A) (CC). The (GG) has direct access from H-S to Upper Bergen. The (F) train has direct access from Jay to Bergen-LL. There is a by-pass where the (F) must divert, go up a ramp and then merge back to the (GG) at Bergen-UL. Posted by LA Scott on Tue Feb 13 17:01:44 2018, in response to Re: THE L TRAIN SHUTDOWN SOLUTION THAT WORKS, posted by MainR3664 on Tue Feb 13 15:13:32 2018. There was a proposal in the last year that involved cutting away the east edge of the platforms and installing the switches there, ignoring all sorts of reasons why it would be a bad idea. As others have said, the grade starts changing right at the end of the platform. Posted by jabrams on Tue Feb 13 18:23:52 2018, in response to Re: THE L TRAIN SHUTDOWN SOLUTION THAT WORKS, posted by Broadway Lion on Tue Feb 13 16:18:21 2018. As I have said money times, put the switches close to Lafayette on the A/C and Fulton on the G when the two lines are in the 6 track tunnel and adjacent to each other. Yes it would be an at-grade crossing. One switch from the E/B A connecting to the W/B C then the E/B G and then the W/B G.
Posted by LA Scott on Tue Feb 13 19:16:08 2018, in response to Re: THE L TRAIN SHUTDOWN SOLUTION THAT WORKS, posted by jabrams on Tue Feb 13 18:23:52 2018. Are the Crosstown and Fulton at the same level long enough and close enough for switches between them? At Fulton/Lafayette, they are at different levels. Even if you could, it would be disruptive remove the columns needed for the switches. After all that work, the result of using the switches is screwing up all the trains to avoid a cross platform transfer. I think that how the IND set up the tracks there is the worst design choice they made, but that ship sailed long ago. Posted by jabrams on Tue Feb 13 20:21:55 2018, in response to Re: THE L TRAIN SHUTDOWN SOLUTION THAT WORKS, posted by Avid Reader on Tue Feb 13 10:26:20 2018. G has no access to the LL at Bergen. Passengers are the G cross platform to the A or C. What can be easier. Posted by AlM on Tue Feb 13 20:39:28 2018, in response to Re: THE L TRAIN SHUTDOWN SOLUTION THAT WORKS, posted by jabrams on Tue Feb 13 20:21:55 2018. G northbound to Court Square, to the southbound M, which is not a particularly crowded train. A far shorter trip to midtown from Williamsburgh. Posted by Avid Reader on Tue Feb 13 21:11:57 2018, in response to Re: THE L TRAIN SHUTDOWN SOLUTION THAT WORKS, posted by jabrams on Tue Feb 13 20:21:55 2018. Well then, that won't work. Does anyone have a track layout for the Bergen St. area to share? Posted by AlM on Wed Feb 14 00:29:50 2018, in response to Re: THE L TRAIN SHUTDOWN SOLUTION THAT WORKS, posted by Avid Reader on Tue Feb 13 21:11:57 2018. Lion posted it in this thread. Posted by William A. Padron on Wed Feb 14 07:49:01 2018, in response to Re: THE L TRAIN SHUTDOWN SOLUTION THAT WORKS, posted by Elkeeper on Tue Feb 13 16:01:44 2018. Also, there are no installed signals on the north side (west bound)of the unused tracks between Hoyt and Court Streets, with a steel wall as a block at the west end of the platform at Hoyt. With the exception of the home ball signals at Court Interlocking, there are no operating signals anywhere along the tracks within the Transit Museum at platform level. Posted by Lou from Brooklyn on Wed Feb 14 08:26:49 2018, in response to Re: THE L TRAIN SHUTDOWN SOLUTION THAT WORKS, posted by William A. Padron on Wed Feb 14 07:49:01 2018. Posted by Broadway Lion on Wed Feb 14 13:06:17 2018, in response to Re: THE L TRAIN SHUTDOWN SOLUTION THAT WORKS, posted by Lou from Brooklyn on Wed Feb 14 08:26:49 2018. IIRC: The metal wall is a DOOR... It Moves. iT IS THERE TO PROTECT THE MUSEUM FROM INTRUDERS. Posted by Elkeeper on Wed Feb 14 14:09:34 2018, in response to Re: THE L TRAIN SHUTDOWN SOLUTION THAT WORKS, posted by AlM on Tue Feb 13 20:39:28 2018. Why go that far north? You could run extra short line "G" trains between Smith-9th Sts and Nassau Ave to supplement regular service. Posted by AlM on Wed Feb 14 14:21:49 2018, in response to Re: THE L TRAIN SHUTDOWN SOLUTION THAT WORKS, posted by Elkeeper on Wed Feb 14 14:09:34 2018. Why go that far north? Because midtown is opposite the very north end of the G, not opposite the southern portion of the G.
If anything, they should run extra trains between Bedford Nostrand and Court Square, and add more southbound Ms as well as more northbound Ms.
Posted by Elkeeper on Thu Feb 15 14:13:12 2018, in response to Re: THE L TRAIN SHUTDOWN SOLUTION THAT WORKS, posted by Broadway Lion on Wed Feb 14 13:06:17 2018. And from mad monks from the Dakotas! LOL! Posted by Avid Reader on Thu Feb 15 15:28:33 2018, in response to Re: THE L TRAIN SHUTDOWN SOLUTION THAT WORKS, posted by AlM on Wed Feb 14 00:29:50 2018. Posted by Ancient Mariner on Thu Feb 15 16:48:35 2018, in response to THE L TRAIN SHUTDOWN SOLUTION THAT WORKS, posted by ren on Tue Feb 13 00:28:59 2018. If they were to replace the express (center) track on the Myrtle Avenue viaduct as part of the current rebuilding project, then an empty train could wait on the center track at Wyckoff for an 'L' shuttle to arrive downstairs. In the AM the transferees could then be given an express ride into Manhattan and up Sixth Avenue. And the opposite run could be provided in the PM. Posted by Wallyhorse on Fri Feb 16 08:09:49 2018, in response to THE L TRAIN SHUTDOWN SOLUTION THAT WORKS, posted by ren on Tue Feb 13 00:28:59 2018. Your plan of connecting the (G) to the (A) won't work for reasons already detailed here. They would also have to close the train level of the museum to have the (C) terminate at Hoyt-Schermerhorn because the crossover is right because the entrance to Court Street (Transit Museum). No way in the world this works. Posted by Michael549 on Fri Feb 16 08:25:08 2018, in response to Re: L Train Shutdown, posted by Wallyhorse on Fri Feb 16 08:09:49 2018. This is a first in a long time. Wallyhorse is actually telling someone else that their wild idea won't work! It is all good, in a way! Posted by Wallyhorse on Fri Feb 16 10:37:34 2018, in response to Re: L Train Shutdown, posted by Michael549 on Fri Feb 16 08:25:08 2018. What I suggest always is looked at on track maps before I post. It had been long noted before now why the (G) and (A) can't cross over, though I think if the IND had to do it over they would have found a way to have the trains cross over at Hoyt in case the (A) or (C) had to be diverted or the (G) was needed to go to Manhattan. Posted by Wallyhorse on Fri Feb 16 10:41:34 2018, in response to Re: THE L TRAIN SHUTDOWN SOLUTION THAT WORKS, posted by AlM on Wed Feb 14 14:21:49 2018. Except that I would be encouraging people to take the (L) the other way to Fulton and do a new OOS transfer to the 2/3/4/5/B/D/N/Q/R at Atlantic-Barclays or to Hoyt-Schermerhorn for the A/C there to cut down on people at Court Square, which I still think is going to be a disaster. Posted by Wallyhorse on Fri Feb 16 10:43:57 2018, in response to Re: THE L TRAIN SHUTDOWN SOLUTION THAT WORKS, posted by LA Scott on Tue Feb 13 19:16:08 2018. If the IND had it to do over again, I suspect they would have found a way to do a crossover to allow the A/C/G to go to the other line when needed. Posted by Wallyhorse on Fri Feb 16 10:46:19 2018, in response to Re: THE L TRAIN SHUTDOWN SOLUTION THAT WORKS, posted by Elkeeper on Tue Feb 13 16:10:41 2018. Except riders at 4th Avenue (the next stop) who use the transfer there to the (R) would get upset at some (G) trains short-turning at Smith-9th. Posted by Edwards! on Fri Feb 16 13:17:54 2018, in response to Re: THE L TRAIN SHUTDOWN SOLUTION THAT WORKS, posted by jabrams on Tue Feb 13 18:23:52 2018. Major structural work would have to be done to create a space for switching. Basically, too much of an expense for a lightly used crossover. Posted by Jackson Park B Train on Fri Feb 16 13:31:07 2018, in response to Smith-9th Streets/4th Avenue, posted by Wallyhorse on Fri Feb 16 10:46:19 2018. Which of course was the south terminal for decades. Posted by Edwards! on Fri Feb 16 13:36:13 2018, in response to Smith-9th Streets/4th Avenue, posted by Wallyhorse on Fri Feb 16 10:46:19 2018. Smith 9th was and is a terrible terminal. Always has been. Posted by Elkeeper on Fri Feb 16 15:12:42 2018, in response to Smith-9th Streets/4th Avenue, posted by Wallyhorse on Fri Feb 16 10:46:19 2018. It was built as a short-turn terminal for the "GG", when the "D" terminated at Church Ave, before the Culver el connection was made.